When I was a little kid, I remember being captivated by nature documentaries. One of the many things that really captured by imagination were the bone rattling howls of a creature that seemed almost mythic: the howler monkey. These formidable guys seem to have the manes of lions, and purse their lips into a perfect O to make a loud howl that can be heard from up to three miles away! Unfortunately, due to human predation (some people keep these guys as pets, whilst others -ugh!- eat them), this species is under threat. So, when the chance to see some in their natural habitat arose, I couldn’t refuse, and I boarded a plane for Rainforest Expeditions in the Peruvian Amazon. When my plane landed into Puerto Maldonado Airport, a 35 minute plane ride from Cusco, I was nervous as to how I would find my guide, but as soon as I exited, Listen, our Rainforest Expeditions guide, found me! He quickly escorted me to the Rainforest Expeditions main office, just 5 minutes from the airport. We were greeted with warm smiles and cool passionfruit juice, and were asked to repack our luggage into duffel bags for the 15 minute walk to the lodge itself, since duffel bags are easier to carry than suitcases. The way to to the ecolodge was dense with wildlife: we saw loads of caiman alligators, two bighorn birds, countless snowy egrets, one male capybara (the largest rodent in the world – they kind of look like huge hamsters) and many more beasties I couldn’t name. When we arrived to our lodging at Refugio Amazonas we were given healthy, homemade snacks, packed in woven baskets and palm leaves which were super cute and ecological. Listen, our guide, pointed out local fruits papaya and bananas, and informed us that rice, Brazil nuts, and gold are major exports of this region. Our snack packs had Brazil nuts, and our guide told us that the food is cooked with this rich nut oil in the lodge, and our soaps and shampoos were made from it as well. They even make a Brazil nut beer! The Amazon is damn hot, and the staff here know it – they’re constantly offering us cool towels to wipe our sweaty faces and refreshing passionfruit juice. I was fortunate enough to have the deluxe suite at Refugio Amazonas, and it was simply stunning. All the rooms in all the lodges I stayed at – Posada Amazonas, Refugio Amazonas, and Tambopata Research Center – have only three walls, with the fourth being open to the jungle. 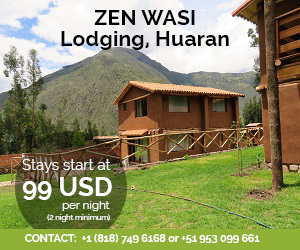 It feels like you are sleeping outside, and you have absolutely gobsmacking views of the wildlife; in fact, it can get quite loud sometimes with all the birds, monkeys and insects tweeting, chirping and buzzing. I awoke at 4am for a morning hike that began at 5:20am. We saw many trees and plants, but it was too foggy to see any wildlife. During the boat ride to the Tambopata Research Center, the river got pretty wild! It was very shallow in some parts, due to it being the dry season, and our guide needed some occasional help with a large tree branch to get us unstuck from the mud. One highlight from the ride was sighting the majestic Ceiba trees, which some people say was the inspiration for the tree in the movie Avatar. Sadly, just like in that move, there is some illegal mining activity going on along the river, even though it’s prohibited, and it’s polluting the river and killing the wildlife. We stopped at Chuncho clay lick and saw two huge, beautiful macaws and a large family of capybara laying by the riverbank. But although I could hear them on occasion, I had yet to see what I really wanted to since my childhood: a howler monkey. 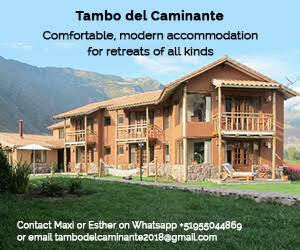 When we arrived at the Tambopata Research Center (TRC), I was delighted to be given a deluxe suite yet again – and I must say, it was even more spectacular than the one at Refugio Amazonas! It boasted a huge outdoor patio, with an outdoor shower and a gorgeously deep bathtub surrounded by lush jungle. An exquisite lunch was served at 1pm featuring local vegetables, fruits and fish, packed with subtle flavors and beautifully presented, too. It was a definite step up from the food at Refugio Amazonas, although I am told the menu there will be changed soon. At lunch, Gabriela Orihuela, the Communications Manager at Rainforest Expeditions, ate with my group and answered all of our questions – she is an absolute treasure trove of knowledge, and knows all the scientific names of all the flora and fauna in both Refugio Amazonas and the Tambopata Research Center, as well as internal information on Rainforest Expeditions. She explained that Rainforest Expeditions at TRC, was the first of the three lodges, but it started as a research center when it was established in 1989. It became a fully functioning lodge in 1992. The research that went on during those beginning years allowed for the National Reserve to be created, as well as the National Park, located just across the Tambopata River from TRC. Once an area is a National Reserve, the government actively protects it, and stripping of natural elements or logging of any kind is prohibited. We were told that the second lodge, Posada Amazonas, started 22 years ago as a joint venture between Rainforest Expeditions and the local community Infierno. In 2016, 100% of ownership moved to this local community, who have used the profits from this lodge to better their local school, start a new lodge of their own, and be able to protect and conserve the beautiful jungle that surrounds them. 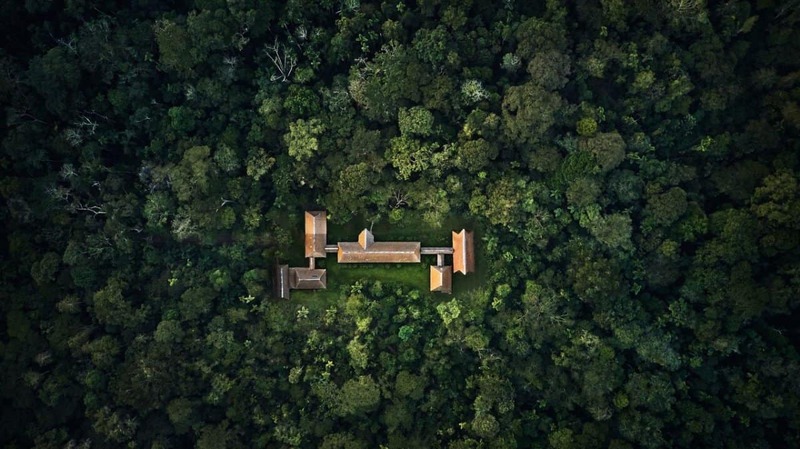 Refugio Amazonas, the third lodge, is located on a giant Brazil nut concession. Before Rainforest Expeditions arrived, this land experienced a lot of logging, and the animals were heavily hunted during every Brazil nut harvest. 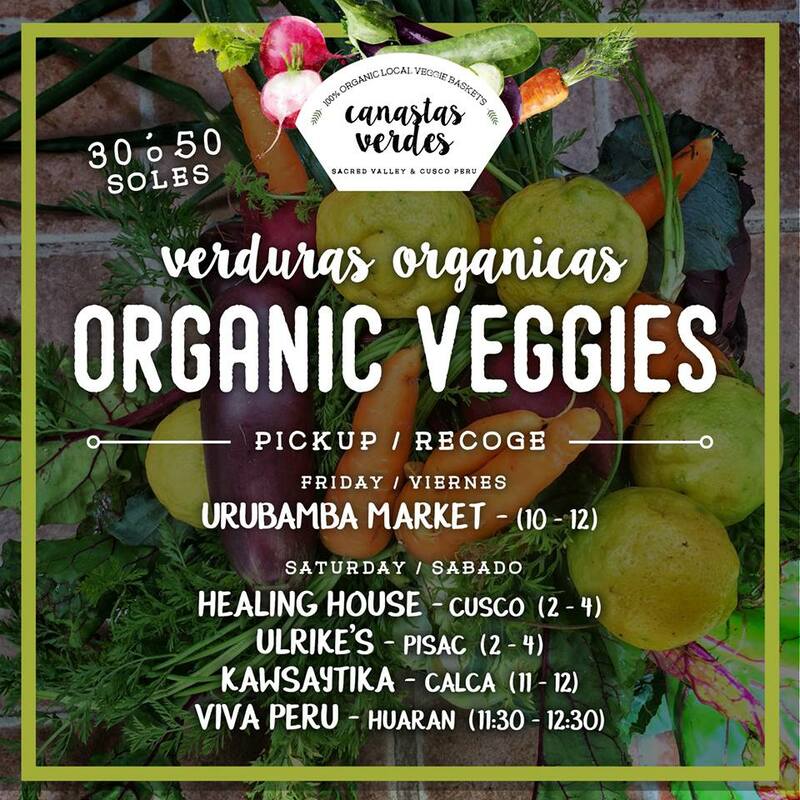 But for the last 13 years since it’s ownership, Rainforest Expeditions has been actively conserving this land and all the flora and fauna on it through their deal with the local farmers, the Valeras, that come to harvest, every year from January to mid-February. Every year, Rainforest Expeditions feeds these farmers, so they don’t hunt the forest out, and they prohibit logging. I also learned that Refugio Amazonas and Tambopata Research Center are both major research stations. 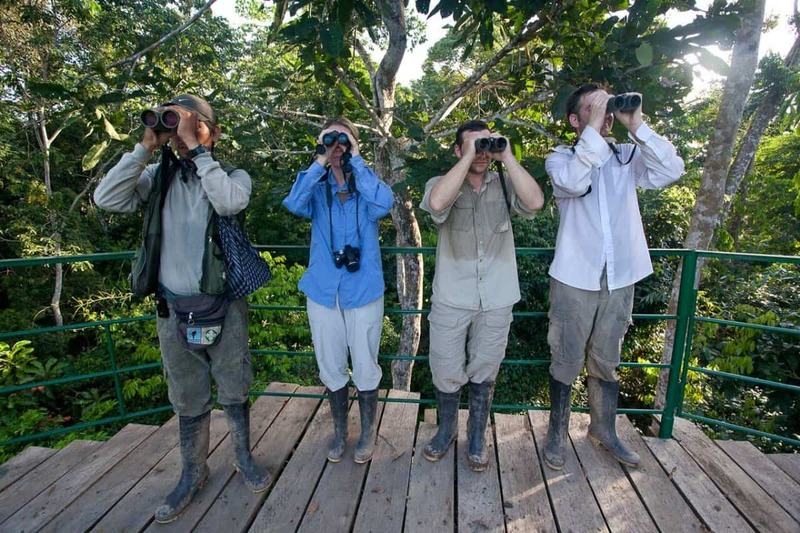 In Refugio Amazonas, the guests that come to stay in the lodge have major opportunities to help with research. Through the Discovering New Species and the Wired Amazon projects, guests have helped discover 12 new species of tiger moths, and they got to name them, too! Through AmazonCam and Zooniverse.org anybody can help scientists spot wildlife in the area. With Zooniverse.org also comes Aerobotany, which is a drone’s assessment of the Brazil nut trees to project production for the coming harvest. Guests (and anyone with access to the internet) can help analyze the drone’s data by counting Brazil nut trees and spotting flowers. 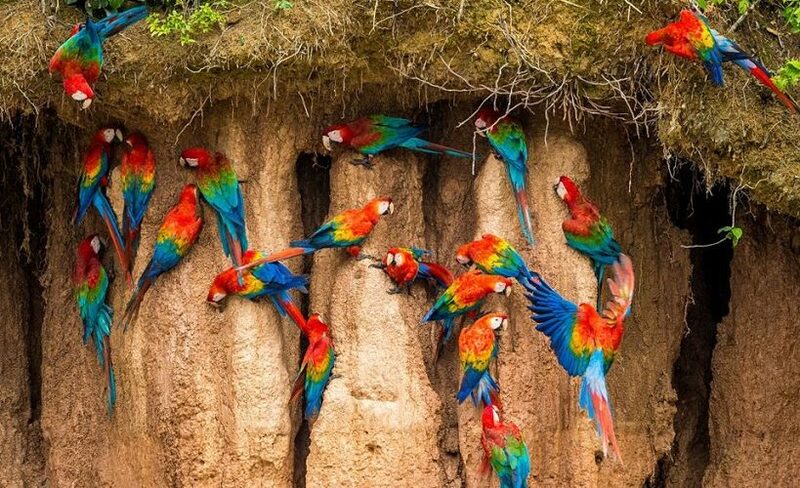 The Macaw Project, which coincides with the start of Rainforest Expeditions and the Tambopata Research Center, is a joint venture between TRC and Texas A&M University in the United States. The first macaws that were part of this project still come to have breakfast with the guests, more often than not (although, it’s really not healthy to feed them). Part of the lodges’ profits goes towards continued research and continued conservation efforts. After this informative chat, we embarked on our first jungle trek. We saw a big mama tarantula, living in a hole in a tree, and drew her out with bait- a leaf on a stick. We saw many scarlet macaws and many large, beautiful trees. All the shrubbery has such unique patterns and leaf structures. We spotted lots of mushrooms, some of which were edible. On the way back to our rooms, we saw two medium sized spider monkeys, so-called because they can jump from tree to tree and even to the ground from a high branch on a tree. I took a warm shower in my outdoor bathroom (there’s an indoor option as well) and my view of this vivacious jungle was nothing short of spectacular. I awoke to all kinds of birds chirping and lots of very colourful moth and butterfly wings scattered like confetti all over the floor of my bedroom. We went to the nearby Clay Lick to see parrots and macaws licking clay. One of the top theories as to why they do this is that they are not getting sufficient sodium from the food they are eating, and therefore are supplementing with this mineral-rich delicacie. And then we saw some real action: a giant flock of green parrots and scarlet macaws swooped in for their daily clay fix. The flurry of colours of all the birds flying in together was mesmerizing! Walking to breakfast, I could hear howler monkeys howling SUPER CLOSE to the bridge that extends between the rooms and the common areas. At breakfast, there were macaws accompanying us at the tables and I saw a wild, red brocket deer that was super cute, with a fluffy tail – but still no howler monkeys. The second day, we heard howler monkeys again, and decided to follow our ears. Sure enough, they were very close to our rooms – we saw one alpha male and several mamas and babies – so precious, and so playful! They kept wrestling with each other and swinging from branches, even as their mom lay down for a nap. Listen said Howler monkeys are one of the laziest monkeys in their region; all they do is sleep and eat leaves- 70% of their diet are the leaves of trees, which is very unusual for a monkey. Sounds like a pretty good life to me! Thrilled at having fulfilled a lifelong dream, I then set out with the group to hike through a bamboo forest. On our way, Listen painted our faces with sanipanga leaf, which functions as a natural mosquito repellent and antiseptic. It has a gorgeous violet color once applied. Soon after, we ran into a group of wild white lipped peccary pigs; they smelled absolutely HORRIBLE! We saw many “walking trees” which constantly grow new roots in the direction of the sun whilst losing their old roots. They move around 25 cm per year. We saw many birds: powhil, pale winged trumpeters, blue and gold macaws, and green and red macaws which are apparently super uncommon to spot. What an unforgettable experience this was! Exploring the Amazon is like visiting another planet; here, man takes second place to the flora and fauna that rule this mysterious place. Although the food was delicious, the rooms beyond comfortable, the guides knowledgeable, I never felt that I was a tourist in a hotel; rather, I was more like an astronaut exploring a new frontier. If you’d like to see the Amazon Jungle, I would highly recommend Rainforest Expeditions, especially Tambopata Research Center. Who knows? They may well help you, too, fulfil a childhood dream.